The present paper focuses on solute segregation occurring in directional solidification processes with sharp solid/liquid interface, like silicon crystal growth. A major difficulty for the simulation of such processes is their inherently multi-scale nature : the impurity segregation problem is controlled at the solute boundary layer scale (micrometers) while the thermal problem is ruled at the crucible scale (meters). The thickness of the solute boundary layer is controlled by the convection regime and requires a specific refinement of the mesh of numerical models. In order to improve numerical simulations, wall functions describing solute boundary layers for convecto-diffusive regimes are derived from a scaling analysis. The aim of these wall functions is to obtain segregation profiles from purely thermo-hydrodynamic simulations, which do not require solute boundary layer refinement at the solid/liquid interface. 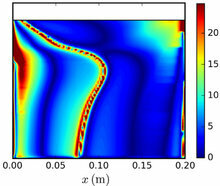 Regarding industrial applications, various stirring techniques can be used to enhance segregation, leading to fully turbulent flows in the melt. In this context, the scaling analysis is further improved by taking into account the turbulent solute transport. The solute boundary layers predicted by the analytical model are compared to those obtained by transient segregation simulations in a canonical 2D lid driven cavity configuration for validation purposes. Convective regimes ranging from laminar to fully turbulent are considered. Growth rate and molecular diffusivity influences are also investigated. Then, a procedure to predict concentration fields in the solid phase from a hydrodynamic simulation of the solidification process is proposed. This procedure is based on the analytical wall functions and on solute mass conservation. It only uses wall shear-stress profiles at the solidification front as input data. The 2D analytical concentration fields are directly compared to the results of the complete simulation of segregation in the lid driven cavity configuration. Finally, an additional output from the analytical model is also presented. We put in light the correlation between different species convecto-diffusive behaviour ; we use it to propose an estimation method for the segregation parameters of various chemical species knowing segregation parameters of one specific species.